Working at Ford in the early 1990’s, I had the privilege of learning about lean manufacturing from some of the best lean thinkers at the time. Looking to develop and implement a production system, Gifford Brown, our plant manager, sought the assistance of key ex-Toyota Georgetown powertrain leaders. Russ Scaffide, John Allen, Dwight Clark and Bill Costantino joined the Cleveland Engine Plant 2 (CEP2) team as consultants and helped author and implement what was then called the Cleveland Production System. 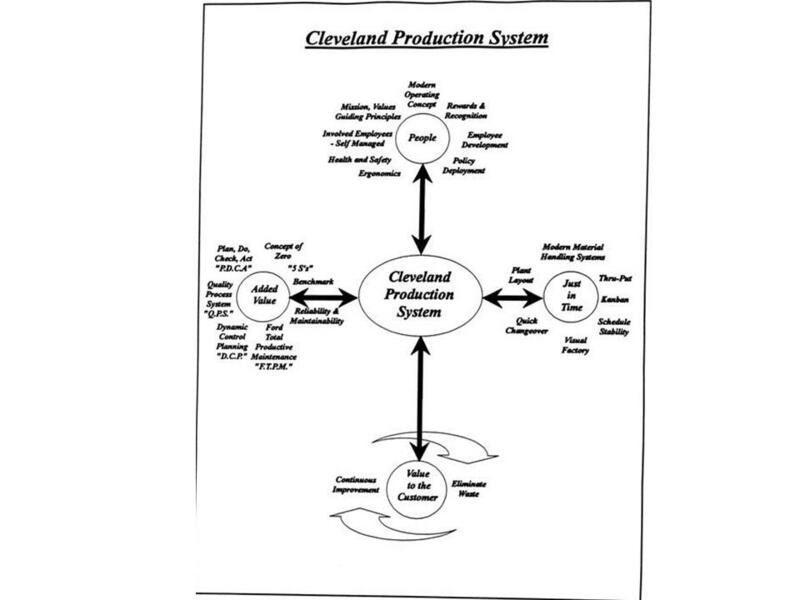 The Cleveland Production System (CPS) became the forerunner to the modern Ford Production System (FPS), and its implementation at CEP 2 led to the plant being recognized with the Shingo Prize for Excellence in Manufacturing in 1996. My role (as a cost analyst at the time) in the development of the CPS, in addition to taking the handwritten model and creating the slide above, was to proof-read the documents that were created. I was new to manufacturing, however, my prior background at what was then Ernst & Whinney‘s National Marketing headquarters in Cleveland, included conducting secondary market research on potential client companies, their industries, officers, directors and our competitors. We used this data to support the writing of major audit and management consulting proposals, which we were also responsible for proof-reading – a valuable skill that I’ve used to learn as much as I can throughout my career. Proof-reading the early documentation of the CPS gave me the opportunity to learn about this new way of thinking in manufacturing and because I had less to un-learn, I was able to pick up on the concepts quickly and contribute to the discussion. The model – and its implementation – with Ford and UAW leaders responsible for jointly championing and teaching the individual elements, served as a visual reminder of our responsibilities. Our role was to take all of these lean tools, systems and principles and create value for the customer through continuous process improvement and the identification and elimination of waste. Attending the initial training, then eventually becoming a trainer for the system, there was one thing that always bothered me about the model. The model placed itself at the center, rather than the customer. Our model seemed to put all of its weight on top of the customer and never seemed quite right. I sought to reconfigure the model as a “Focus within a Framework”. 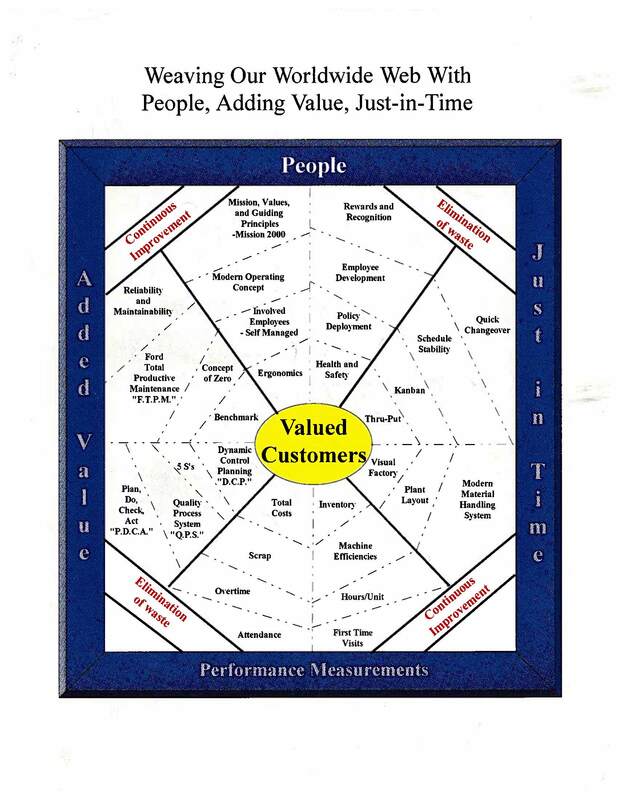 I placed the customer at the center of the model, and then built the framework with the “pillars” of the system – People, Added Value, Just-in-Time, and Performance Measurements. Once the focus was placed within the framework, I then used the elements of the production system to create the web. As our plant was a supplier to Ford assembly plants around the world, I used the (new at the time) catch phrase “Worldwide Web” to attract the attention of attendees at a joint Ford / UAW quality conference in Dearborn in 1996. The other influence on my spider thinking came from a student who I was supervising in my first job out of college at a major retail store. She was working in the evening and when asked about getting stock out of the storeroom and onto the shelves, commented “if it wasn’t for the customers, I would be able to get my work done.” This view of the customer as a nuisance fit nicely with the transformation in thinking required to move from mass (where the customer is sometimes viewed as a nuisance) to lean, (where the customer is nourishment). In my web analogy, the contrast between the way that humans view flying insects as a nuisance and the way that spider’s view flying insects as nourishment emerged. In fact, a spider’s existence is dependent upon its ability to capture and hold onto insects that move in and out of its “Window of Opportunity”. Much like customers’ disposable income should be viewed as the lifeblood of any organization. If the spider’s web doesn’t cover the entire opening, potential nourishment can fly through without being captured. If the web breaks, the ability of the spider to quickly react and fix the problem directly impacts the spider’s future viability. An organization’s leaders are responsible for identifying the organization’s Window of Opportunity, providing a focus on the customer, and creating the systems that enable employees to create value to capture and hold onto customers. Quick reactions to breakdowns and weaknesses in the systems when identified, are necessary to maintain organizational stability and provide continued growth. Principles – the focus and the framework of any organization – linked through systems and tools enable employees to create and provide increasing value to customers. Thus, our “Window of Opportunity” defines how well our Principles connect to our customers and our ability to create value through the continuous improvement in our systems and tools and the identification and elimination of waste. Continual assessment of the effectiveness of our systems and adjustments when and where necessary will determine the amount of nourishment we receive. Unfortunately, the model, which I found attractive and intuitive, never caught on as the CPS morphed into the FPS. However, the learning I obtained from creating it and thinking through all of the various messages it conveys have helped me as a frame of reference when assessing other lean organizations. It was especially helpful the following year when I moved to Cleveland Engine Plant 1 to implement the new Ford Production System in a plant that was in a slightly different emotional state. I’ll share that story in my next post. Are you capturing your customer’s disposable income that is moving in and out of your Window of Opportunity? Are your systems complete and connected? Do you react quickly to signals your customers are sending, indicating their presence in your window? When your systems are weak or broken, do you respond immediately to minimize the loss of potential customers? Do you view your customers as a nuisance or nourishment? Shingo PrizeDid you ever have one of those chance encounters with an individual that makes you sit down and really think about what just happened? It happened to me recently. Our Neurological Institute has a “go to gemba” process where each of our administrators spend at least a week each quarter, making daily rounds in our in-patient unit to talk with patients and determine if we are meeting their expectations for care. I have found the interaction with our patients some of the most gratifying work that I’ve done while working at the Clinic. Last week, while connecting with our patients, I had a chance encounter with a very interesting man. He took the time to let me know where we had fallen short in our care of a loved one. He was not upset or angry, he felt the need to share his experience and I seemed open to listening, so we talked. As we continued our conversation, a familiar language started to emerge and I found myself actively engaged in a discussion of root cause, errors, defects, visual management, standard work, etc. We were talking lean. Being a student of lean, I recognized the principle of “Pursuit of Perfection” and wanted to learn more about how this principle has been applied in the dairy business. Over the next two days, we spent a total of nearly three hours discussing the opportunities he saw for us to improve our patient care processes and he shared with me the details of his consulting business where he helps dairy farmers focus on quality at the source and increase milk production through the reduction of disease. Without a college degree or a lean certification or any formal lean training, he has mastered the application of lean principles, systems and tools as described in the Shingo Prize for Operational Excellence. His simple philosophy – listen to the cows. He told me about how milking parlors are built for the efficiency of the farmer; however, their design results in decreased milk production from the cows (workers). Automation and technology take the farmer away from the cows and is creating a whole host of quality problems – from diseases, passed on through their milk and beef to humans, to increased costs due to inefficient milk collection techniques that cause cows to produce less milk. We talked about the backwards way our current health care system places its emphasis on treating diseases, rather than preventing them. He told me about his application of lean principles such as lead with humility, respect for every “cow”, flow, scientific thinking, constancy of purpose, systems thinking, and value for the customer. My head was spinning. I was drawing parallels with the tools of lean such as visual management, standard work, quick changeover, error-proofing, preventive maintenance, etc. Could the humble cow be the start of the Healthcare value stream? I’ve made the transition from manufacturing to healthcare and have seen how the principles of lean apply across multiple, diverse industries, including lean dentists and lean government. This was the first time I was really exposed to the potential of lean – at the source – in the supply chain of the food and farming industries – before the production or processing stages – and recognized the connection to the healthcare industry – a strange customer of the current food processing business. We traded contact information and vowed to continue our discussion. We’ve asked him to serve on our Patient Advisory Council and he’s asked me to help spread his message on disease prevention. It sounds like a good deal so far. As my father once told me, “The more you know, the more you find out you don’t know”. I learned a lot last week and recognize that I have a lot more to learn. My first understanding of lean can be traced back to a specific six hours early in my career spent helping my plant manager, Gifford Brown, prepare a presentation to a group of suppliers. I had recently transitioned into the training department and had been teaching many of the lean tools classes that we offered to all employees. My supervisor and I were called to Gifford’s office and he started the conversation by indicating that he needed our help in capturing his thoughts to prepare the presentation, but before he turned us loose, he first wanted to educate us on the finer points of lean. My supervisor and I looked at each other hesitantly (after all, we were already teaching this stuff, what more could we learn?). For the next three hours, Gifford methodically explained lean to us. He started with the concept of leadership expecting excellence from employees by empowering them with systems and tools that supported their desire to improve their own work. He explained the cultural aspects of lean that are necessary before the tools can be effective. He linked all of the lean tools into a systems perspective describing how they all interacted with and were dependent upon each other. This was pretty standard stuff that we had been teaching already as part of our overview of the Cleveland Production System, the forerunner to the modern Ford Production System. What was different though was that Gifford went on to explain that there was no prioritization to the implementation of the tools. The starting point for implementation was first trusting, then involving employees, who would start to pull the tools they needed as they sought ways to improve their work processes. The layout of the refurbished Cleveland Engine Plant 2 had been worked on for months to maximize the flow of materials and minimize waste. Gifford started to explain how the departments were laid out to support principles such as respect for people, flow, just-in-time, and value to the customer. Once the layout was maximized, a visual management system and a total productive maintenance philosophy was incorportated in equipment design to support quick changeovers, level production schedules and minimum in-process inventory. A zero defects mindset was established, where standard work was developed by the front-line workers and workplace organization was established through on-going 5s activities with all employees. Visual management systems highlighted abnormalities, PDCA problem-solving techniques were utilized by teams to address abnormalities and error-proofing devices were developed to address root causes of problems and eliminate or correct the errors that were leading to defects. We had been teaching the tools all along. Gifford was now presenting the overall system in a fashion that didn’t stress one tool at the expense of another. Instead it was implement the tool that was most needed to continue the implementation of another tool at a higher level. Start and go as far as you can until you realize that you need something else in order to continue to improve. Your expectations and how you address abnormalities along the way will lead you to where you want to go. So when setting expectations, leaders should Expect Excellence! I took pages of notes and walked out of the discussion with my head spinning – it made so much sense. I put together a presentation that tried to capture all that I had heard and then one week later, spent three more hours with Gifford editing and refining the presentation. The slide on leadership expectations had a diamond clipart picture with the words “Expect Excellence” on it. It has served as a continual reminder to me when trying to teach the principles of lean leadership. Next post – Excellence in Action!